Last week, I saw some students were throwing a football in the Pine Grove. It was sunny, the snow had melted, and there was a cool breeze. They were wearing shorts. Columbia is basically just snow right now. Today, some guys ran from Durfee to a pile of snow outside of Phelps Dining Hall. It was 20 degrees out. They jumped on their backs and quickly got up, squealing. They were only wearing shorts. It’s really cold outside. I took this picture as fast as possible. Such is life in Holland, Michigan. For those out of state who may be unfamiliar, Michigan gets the best of every type of weather, multiple times a year. The weather is unpredictable. It started snowing last night, and it’s supposed to snow until Saturday. Holland is experiencing a genuine blizzard. At first, everyone loves the snow! If you read a recent post of mine, you’ll know that I love a good hike in the winter. But in day-to-day life, it’s hard to walk around campus when you forget to wear boots. My Adidas are getting pretty nasty. We love the beauty of the snow, but we don’t love the practical reality of snow. There is a metaphor in there somewhere. We love dreams, ideas, the future, etc., but the day to day grind tests us. Love the snow. Love wet socks. 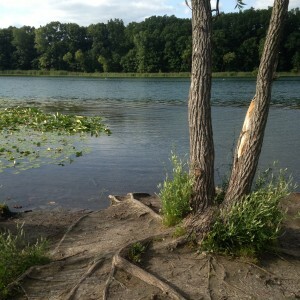 Love Michigan. 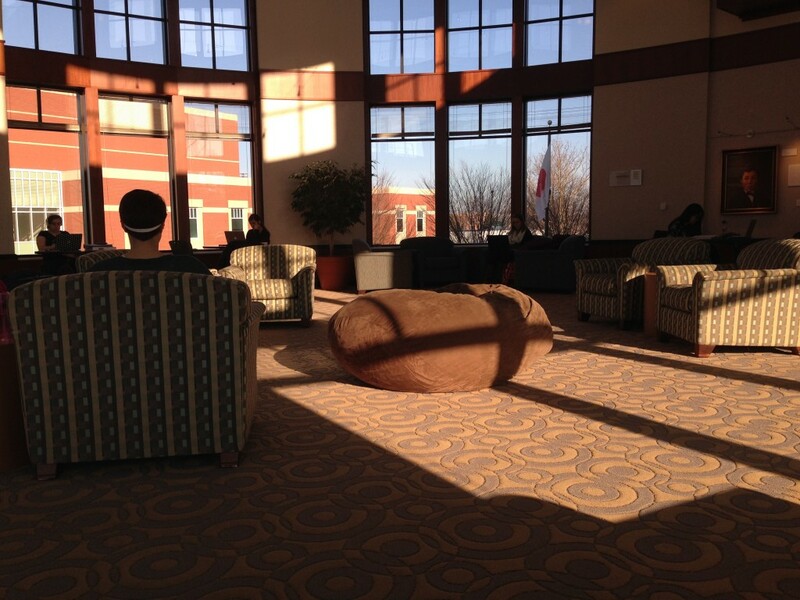 At Hope, there are plenty of great opportunities for students to relax and enjoy life beyond homework. Winter Fantasia (a SAC-sponsored dance), Men’s Night Out and Women’s Night Out (biannual Campus Ministries events) and the Hope-Calvin basketball game occurred either in the past week or will occur this week. Needless to say, college kids can stay busy. But for those lulls in student activity, especially in the winter, here are some ways to create your own fun at school. Liza Anne opened for the Oh Hellos this past Thursday and had a killer set! Go to a sporting event you wouldn’t think to attend! Hope Tennis has matches sporadically in the next few months, lacrosse is starting up, and every now and then the swim team has a home meet. Check out the schedules here. Check out the arts! The Student Activities Committee (SAC) has a concert series with some big names, but when those are thin, you can always catch a Coffeehouse set in the Kletz, see a visiting writer, or enjoy a film at the Knick. Check out the arts at Hope here. 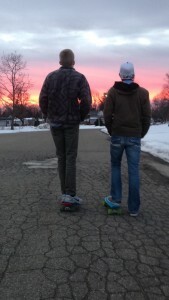 Matt and Trevor like to longboard. Especially when it’s 38 degrees out. Do something seasonal! Downhill and cross country skiing are great. But maybe your a sledding kind of person. Maybe you like snowball fights. Maybe you like broom ball. Do something out of season! 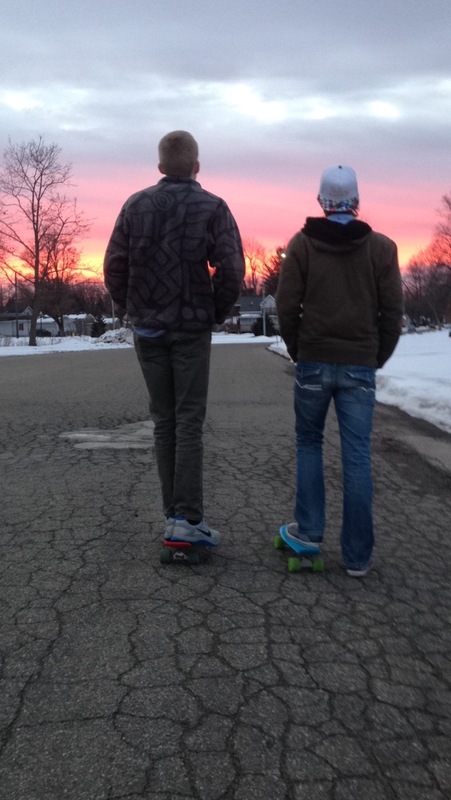 On a dry day, take a longboard or bike ride. Take a trip to the beach. Play a game of soccer in the snow. Collaborate! Play card games with your friends, or make your own. Have a jam session, or just have an intentionally NON-homework hangout in someone’s room. Winter takes its toll. But there are plenty of ways to stay fresh and excited in between study sessions, especially at the beginning of the semester. Good luck! Why Go to Church, When I Go to Hope College? 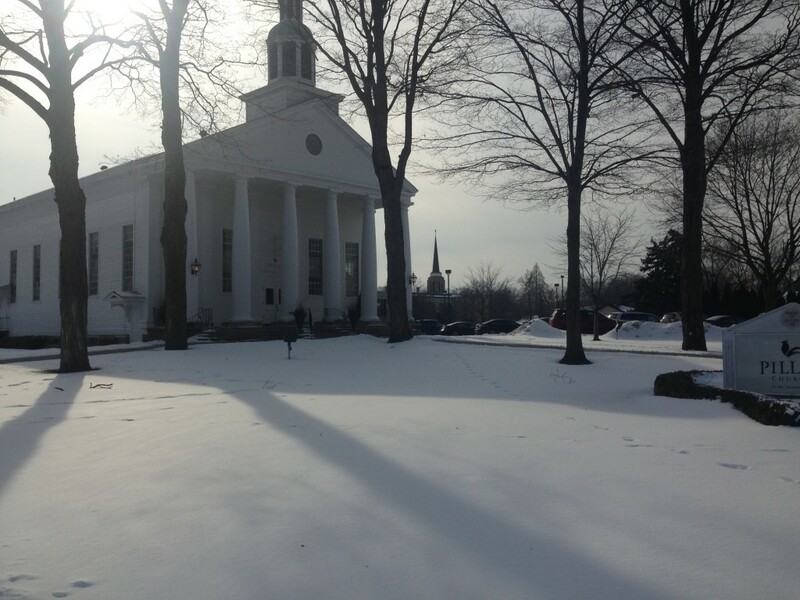 Most students at Hope College grew up going to church with their families. Wake up, eat breakfast, Sunday school, church service, eat family lunch afterwards. We lived a weekly spiritual rhythm during the first 18 years of our lives. Now that we’re away from home, this rhythm changes. We might not go to the same church every Sunday, or go at all. We must decide for ourselves what we believe and where we will spend our time and energy. 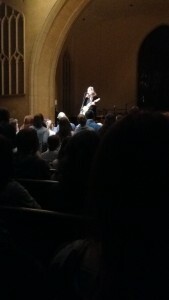 Pillar Church is a beautiful community of college students and families. Holland is the land of a thousand churches. But many of us college students have begun to ask why church is so important in the first place. Many of us attend Campus Ministries services, like Chapel and the Gathering, but a fewer number of us are involved in a local church. Maybe we don’t want to leave campus. Maybe we just want to sleep in. Maybe we think our doubts are too many and too great to go to church anymore. But to not go for these reasons is to miss the point. Hiking with friends is a good way to get out of your routine and allow yourself to question. Church and college are the two of the only places where it’s acceptable to consistently ask the big questions in life. And in the time of our lives in which questions matter most, it would be a shame to miss out on half of the equation. Maybe we need to make new routines, with new people. Hiking regularly with people you care about, attending a nearby church, or grabbing lunch on a weekly basis can become new spiritual practices in our lives. The church is not confined by its walls, but engaging in a spiritual rhythm like regularly attending church breathes new life into the old, weekly grind. Posted on January 25, 2016 January 26, 2016 Author Michael StoneCategories FaithLeave a comment on Why Go to Church, When I Go to Hope College? We have arrived at the end of the semester. Everyone is anticipating final exams, finishing last minute projects, and cramming for tests. When in doubt, get a table to yourself and just get it done. 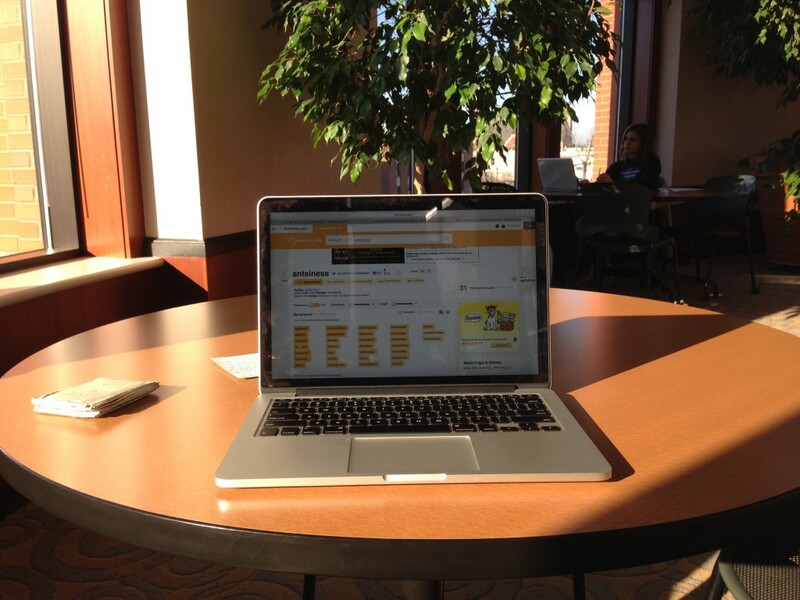 When I sit down to study on the second floor of Martha Miller, I pull out my laptop and lay it on the table. I check my phone. I put it in my backpack. I sigh, and I pull out a folder and a notebook. I pull up Moodle (Hope’s course management system) on my browser. I check my assignments. I pull out a book from my backpack, one that has yellow pages and recently divorced with the original cover. I read and take notes. My knee bounces with anxious frustration. This is class is the worst. I type a short written assignment. I submit my assignment. I pull out my phone. I put my phone away. I slouch in my chair and stare off into space. Five minutes later, I get out a different folder and notebook. I start again. I eventually realize that I haven’t made any progress in half an hour. I pack up, lift my backpack to my shoulder, walk downstairs, and leave the building. Dedicated students devoting their Saturday afternoon to homework. Maybe I’ll study better with some coffee. I head to Lemonjello’s, the local coffee shop, and order a dark roast. I see a friend or two, and talk to them for, Oh, look! An hour has gone by. I walk away. from their table and start to realize the weight of the deadline in front of me. I pull out another book. Now it’s dinner time. I have almost everything done. After dinner I play video games with friends. Oh no. I just remembered I have a paper due tomorrow. It’s 11 p.m. I stay up late, finishing it. I get four hours of sleep. I wake up ten minutes before class. In the elevator, I see an email from my professor. Class has been cancelled. I take the elevator back upstairs, drop my backpack next to my bed, and fall asleep in my clothes. Thanksgiving break! The last deep breath of the semester, before the last two weeks of school and exams. We go home and spend time with family, relaxing and eating higher amounts of food than normal. We’re on the tail-end of Thanksgiving break, but take heart! We have winter break to look forward to. My sister took an early break to visit me! 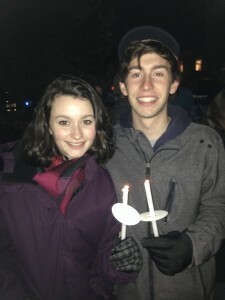 We experienced the tree lighting ceremony together on Monday. Sometimes break is awesome! Or, sometimes we sit around the house, looking for things to do BESIDES homework. Instead of picking our noses, here are some simple, relaxing ideas for enjoying the break. Grab coffee! Find an old friend, someone you need to catch up with, and enjoy a latte together. Share your experiences over the past few months, and ask about theirs! Make something! What better way to relax than sitting in a comfy chair with a pencil and paper? No one is an artistic genius, but whether you like to paint, draw, write, play an instrument or whistle, doing something creative enriches your life, and you don’t always have time for it during school. 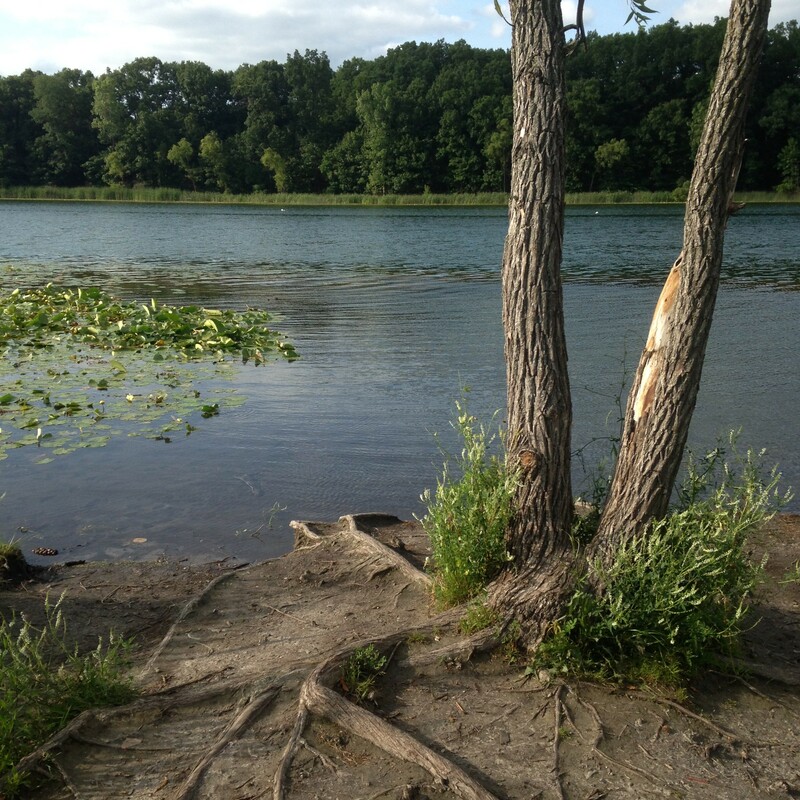 Nothing is better than a hike around Asylum Lake! Go outside! 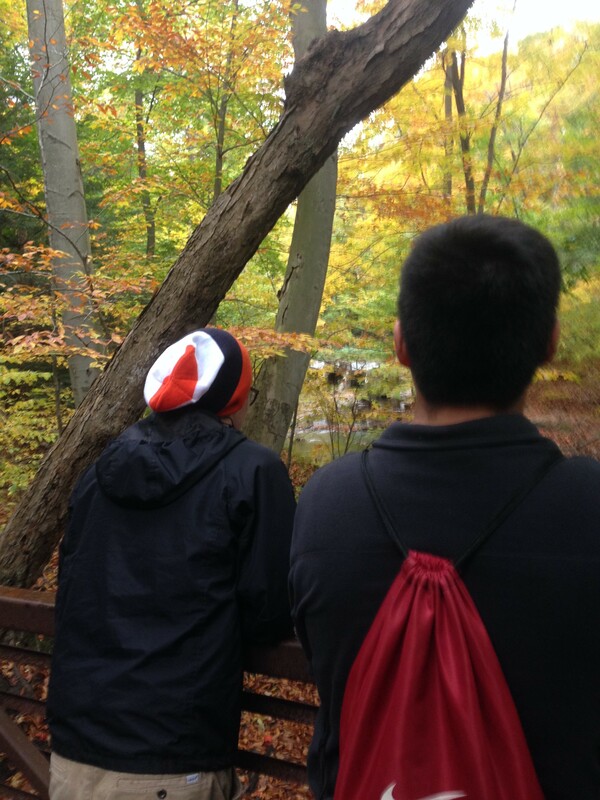 Whether you live near the woods, the ski hill, or the park, make sure to get out in nature during break. Life exists outside of your house! Remind yourself of the beauty of creation. Sleep in! You gotta treat yourself, since you only have so much time until 8:30 a.m. classes pick up again. Stay up late, sleep in until lunchtime. It’s the college way. Play games! Especially conversational games like Apples to Apples, Awkward Family Photos, and Cards Against Humanity. Grab the people around you and a box of your favorite cards, and get to laughing. Let your guard down and enjoy each other. Here’s to a great break! 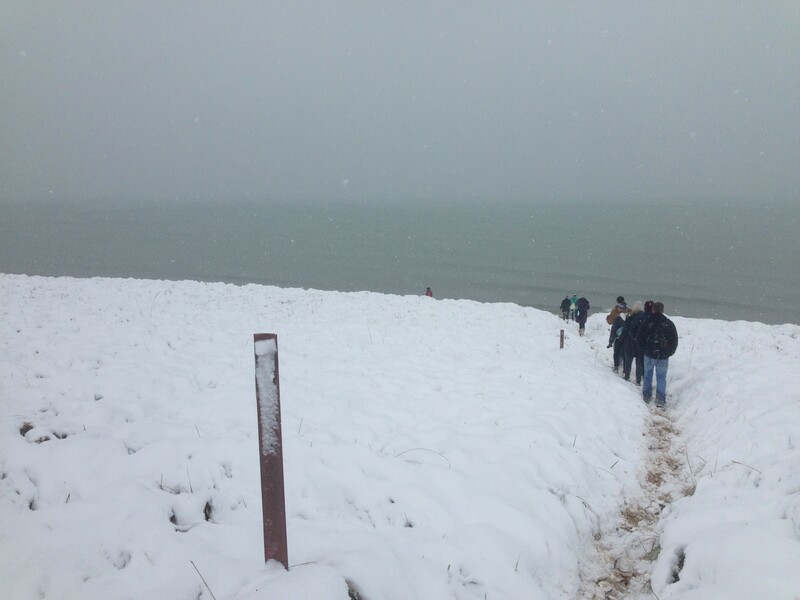 Saugatuck Dunes State Park: Hiking in the First Snow of the Year! The first snow of the year! 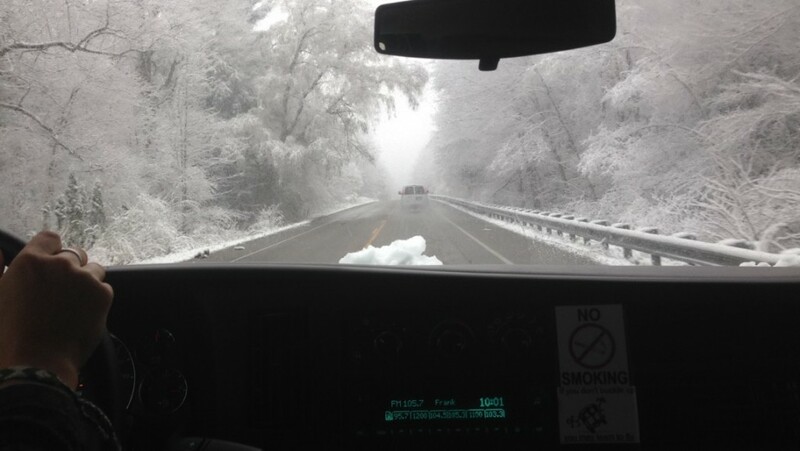 Along with thirty other students, I climbed into a Hope van and drove to the Saugatuck dunes for a morning snow hike with the Outdoor Adventure Club. The trees on the drive to Saugatuck. The day of the first snow of the year is my favorite day of fall. 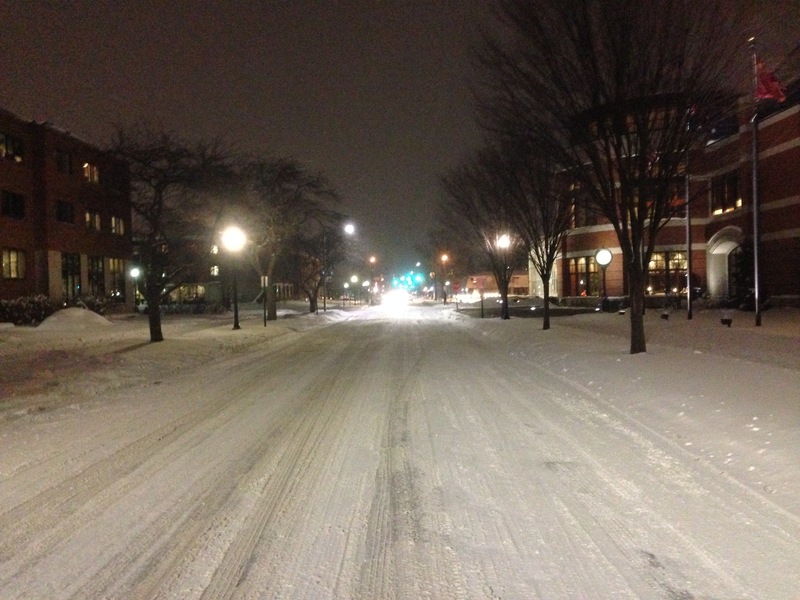 The flakes come down in chunks, and in Kalamazoo they usually melt when they hit the ground. But in Holland, which is closer to the lake, the snow seems to be sticking. Walking the dunes in the midmorning felt like walking through Alaska, or Tibet, or Narnia. The lake hasn’t frozen yet. The juxtaposition of the waves and the snow gave a different sense of the place than in the summer. It felt like the two opposite seasons were being joined together. The dunes in the snow are, like, super cool. The pattern of winter and summer is woven throughout life. Summer represents birth, winter represents death, and then the world is reborn again. 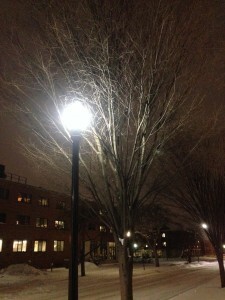 But in the beauty of winter, even in the bitter cold and the sopping wet sweatshirts, we see that all of life is beautiful. 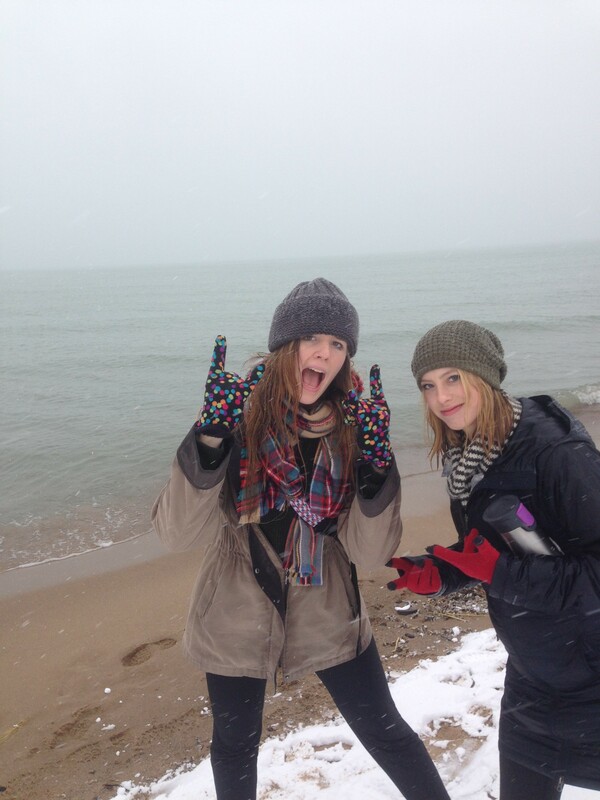 Sydney and Gabby enjoying the snowy beach. So as I sit here typing in the my warm third floor room in Voorhees, I can look out the window and see where trees used to hold leaves. A few weeks back, the leaves fell off, leaving the trees bare and ugly. But now, the trees are outlined in white snow. Even apparent ugliness and death can be beautiful in the right perspective. Posted on November 21, 2015 November 23, 2015 Author Michael StoneCategories Off-Campus1 Comment on Saugatuck Dunes State Park: Hiking in the First Snow of the Year! I heard throughout the day on Friday that something happened in Paris. I kept seeing the word “Paris” in group messages and hearing it in conversations as I passed tables in Phelps. I figured something bad had happened. Honestly, I didn’t know if I wanted to hear about it. I was too struck to be emotionally affected. I knew that people had died. Maybe I was desensitized. We drove to McDonald’s and after we sat down with our food we saw the the number on the news. 153 killed in a soccer stadium. In one moment, I realized my smallness compared to all of humanity. I sat in a chair sipping my milkshake, and felt a hint of the emotional weight of 153 deaths. As I write, the count is down to 129 deaths. 352 people were injured, with 99 seriously injured. Apparently, ISIS is responsible. 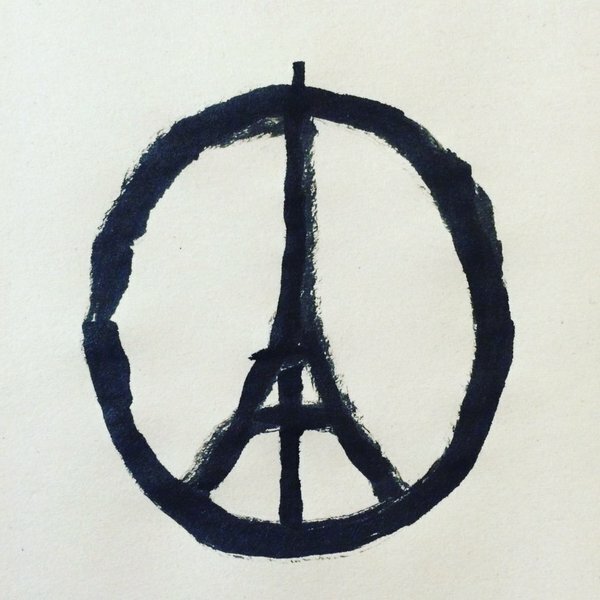 Today, the day after, Paris is a hot topic of conversation. But the murder of 129 people in Paris yesterday actually happened. While there is little we can do to help, maybe the most important thing is to stand in solidarity, to take a moment to allow ourselves to feel grief and mourn the loss of so many. Only today, the day after, did I start to feel heavy with sadness for the people of Paris. 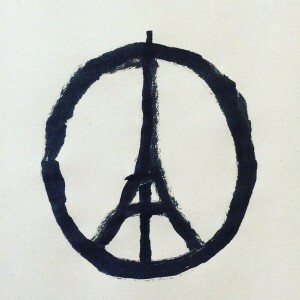 May peace go to Paris. This week is probably the last warm week of the year. 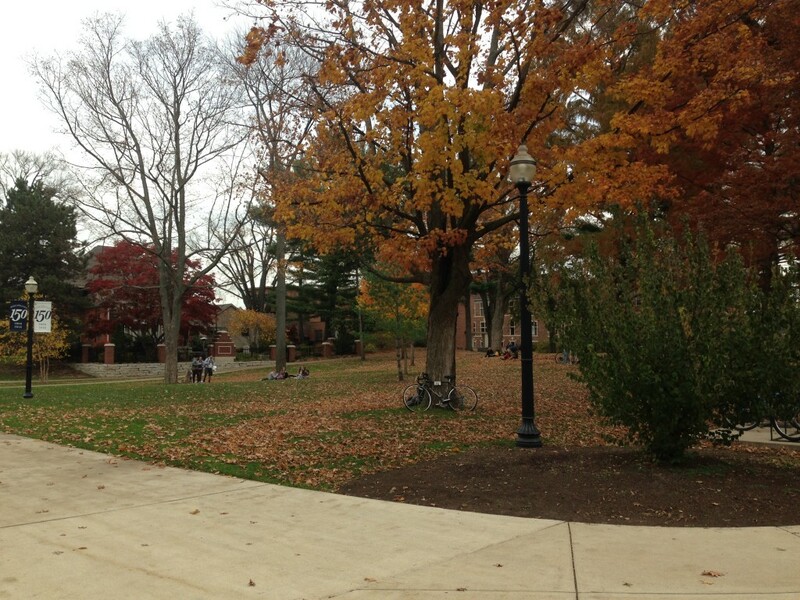 60s and sunny, leaves cover the Pine Grove, and students cover the leaves. I spent all Tuesday afternoon sitting on blankets with friends. We had great conversations and laughed at each other’s jokes. But tension rose when the conversation poked at controversy. I have a different opinion on homosexuality than one specific friend of mine, and I learned that he was just as passionate about the topic as I was. I was expecting a debate, or a heated argument, or mutual frustration at the end of the conversation. We discussed the Bible, biology, and philosophy. We told our stories and the stories of our friends. We disagreed, and sometimes cut each other short to ask questions or challenge ideas. We engaged with each other and didn’t quit in the face of awkwardness. In the end, though we disagreed, we both conceded that the Church should do a better job of including the LGBTQ community. In the end, though we disagreed, we were still friends. There isn’t a more grace-filled type of friendship than that of two people who disagree. We still respect and care about each other, and we understand each other a little more. A little conflict keeps things fresh. Students enjoying the last few days of warm weather. I remember loving Chicago as a kid. The towers, the Loop, the pizza. We used to stop for lunch in the city on our way to Wisconsin. I heard about the Student Activities Committee Chicago Trip, and signed up as soon as possible. We spent this past Saturday in the city. We wandered from place to place and never knew where to go next. We looked up at the ends of skyscrapers and saw the clear sky. Young men, probably my age, sat on the sidewalk with 10-gallon buckets and drumsticks, and hammered the pace of the city into existence. They grinned into their blurry hands and rocked quickly in tempo. 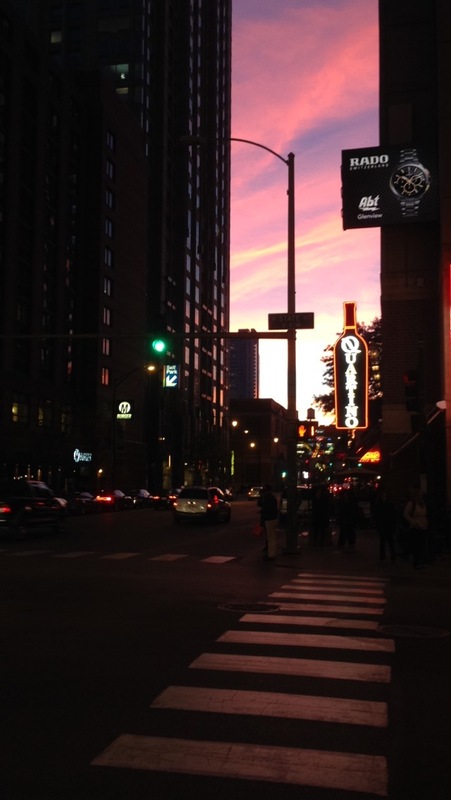 They sat on the curb next to the oblivious cars that sped down North Michigan Avenue. 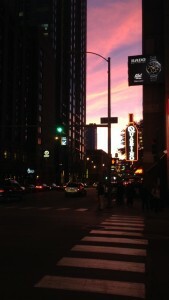 Evening on the Chicago Loop. We crossed the street and the sun reflected off The Bean onto our faces. We looked up and saw in the massive mirror a hundred people gathered around, taking pictures. The strange monument of Chicago loomed over us. We wandered around in stores and had pizza for dinner. Classic Chicago tourist stuff. But I’m from Kalamazoo, a relatively small city. 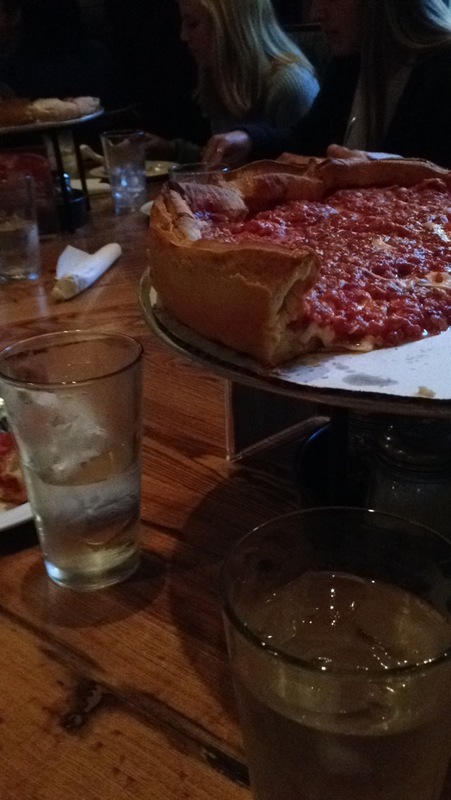 We don’t have Giordano’s on every block. 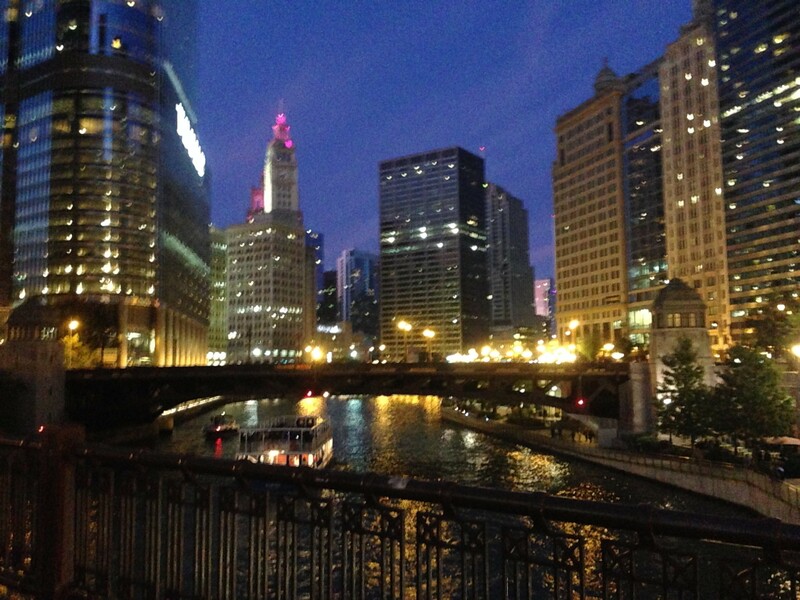 Chicago is huge, a home for 2.7 million, and even walking the streets feels like participating in something bigger. We got lost a few times, and maybe wandering is only wandering. But when a small town kid is swept up in the rhythm of the big city, even for a few hours, it feels like something more. Walking back to the bus we caught the city lights turning on. First, read part 1 here. 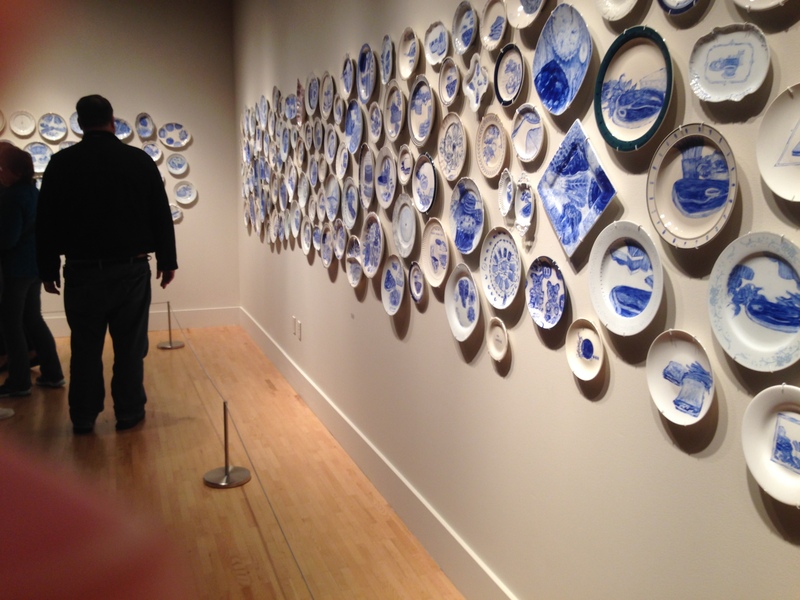 The hundreds of ceramic plates hung heavily on the wall. I walked slowly around a few other pieces in the room, but kept my eye on the plates. The blue on the plates dragged my sight from the various sculptures in the room. Old men and young art students gathered along the walls and I joined them. A curly-haired man with glasses murmured and rubbed his chin. He pointed at an oval-shaped plate. 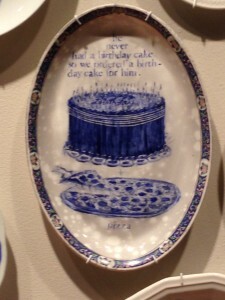 Many of the plates were elaborately designed. This plate had a simple border and typeface scrawled in the middle. I read the plate several times. Other plates featured peaches, turkey legs, and pizza. They varied in diameter, from fist-sized to backpack-sized. I came across another bare plate. The inspiration for the plates was taken from real accounts of last meals. The artist spent a portion of his life in Texas, where he frequently read about last meals in his local newspaper. According to his artist’s statement, executions were events in Texas. My feet slid slowly along with the crowd next to the wall of plates. My eyes hovered over the plates and soaked in the reality of the last meal. An inmate received a birthday cake for his last meal. What a time to celebrate. As I took in the immensity of the exhibit, the hours of work to craft each plate, and the number of deaths, I realized that ArtPrize matters. Art is not just the indulgence of creative minds. Art is seeing and understanding. Art is where our deepest existential longings meet the most tangible realities of our world. Art is accessible by anyone. Art is as simple as plates on a wall. Art is as simple telling the truth. The exhibit was inspired by the last meals of Death Row inmates.